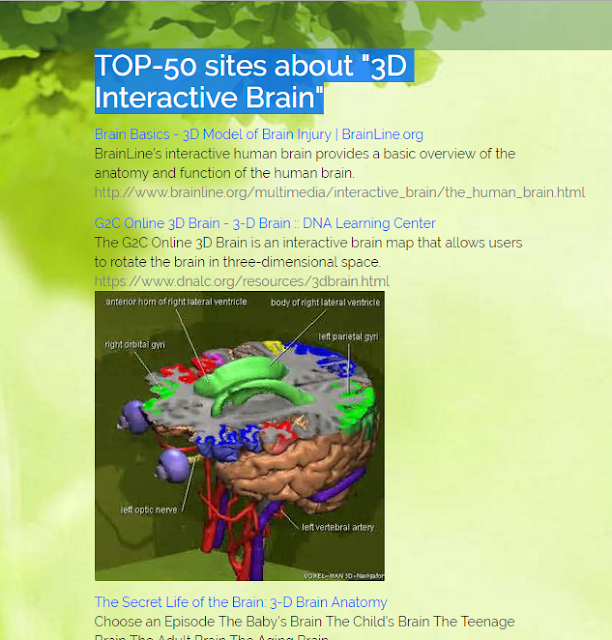 PERO si este tema realmente te interesa o bien te sirven los mapas interactivos del cerebro, EN ESTA WEB encontrarás un TOP-50 sites about "3D Interactive Brain" Son sitios y referencias webs de proyectos que vienen haciendo cosas similares online y muchos también para descargar. Pegué abajo todos los links por las dudas. Actualización 18/4, Hasta que pueda arreglarlos, si no funciona el link, copiar y pegar la url que está en gris abajo de cada descripción. 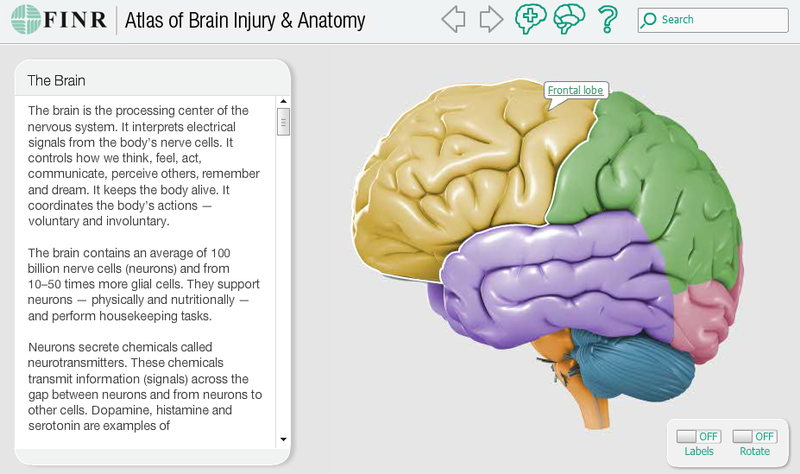 BrainLine's interactive human brain provides a basic overview of the anatomy and function of the human brain. The G2C Online 3D Brain is an interactive brain map that allows users to rotate the brain in three-dimensional space. Explore modern neuroscience with this huge resource of videos, animations and interactive 3D brain. Autism, ADHD, ALZHEIMER'S depression and cognitive disorders. Read reviews, compare customer ratings, see screenshots, and learn more about 3D Brain. Download 3D Brain and enjoy it on your iPhone, iPad, and iPod touch. The brain is incredibly complex — take an interactive journey to see how the brain works and what impact an injury can have. A cool interactive human brain in 3d model. 3D Model of the Human Brain including cerebrum, cerebellum, fornix schema, cerebral aqueducts and removable brain stem. Automatic segmentation of brain MRI data usually leaves some segmentation errors behind that are to be subsequently removed interactively, using computer graphics tools. Open Colleges Interactive Brain. The average number of thoughts that humans are believed to experience each day is 70,000. 0%. START EXPLORING. 0%. Tweet. 3d reconstructions. stroke model. brain & behaviour. UBC Course Micrographs. Interactive Micrographs. 1st Year Laboratories. spinal cord. brainstem. brainstem reflexes. Anatronica. 3D Interactive Anatomy. easy to navigate and explore in 3D. fast search. limited high detail 3D model. limited quiz function. online access. Interactive Atlases ... Content: 2-D and 3-D views of the brain from cadaver sections, MRI scans, and computer reconstructions. ... Neuroanatomy Interactive Syllabus. Brain parts and functions explained in an interactive tour - learn about the impact of Alzheimer's and dementia on memory and other human brain functions. Demonstration of viewing, labeling, searching and saving 3D views of the brain created with Next Dimension Imaging's Brain Interactive. Interact with brain structures and their functions in real-time, 3D space. We created the Hybrid Interactive Brain for students, patients and educators. Interactive Body. Organs Game Plumb together your organs in the 3D jigsaw puzzle. ... Put your senses to the test and try not to let your brain be fooled. e-Anatomy is an award-winning interactive atlas of human anatomy. It is the most complete reference of human anatomy available on web, iPad, iPhone and android devices. The Interactive Ear. The ear is the organ which controls hearing and balance, allowing us to understand our surroundings and position ourselves correctly. Human anatomy and physiology. 3D models and animations of human body systems. Apps and site licenses: English, Francais, Deutsch, Espanol, Italiano, Japanese. Join a British Sign Language tour of the artworks outside Wellcome Collection's galleries. Part of Access Tours and Discussions. Brain Injury Survivor: Matthew Kotei. To use BRAIN GAMES to evaluate yourself, learn about your brain, read about this season and more rotate your device to portrait orientation! An Interactive Map Of The Brain. ... Interactive Brain Map. Can you point out the small squiggle of gray matter that makes up the brain's motor cortex?